Where can you catch great comedy and terrific music all in the same weekend? At AMT, of course! 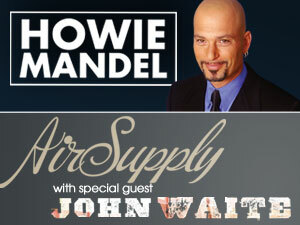 Howie Mandel – Friday, February 10 at 8:00 pm. Click here to purchase tickets now! The next evening, Saturday, February 11, we welcome the Aussie soft rock group Air Supply, and the lead singer of The Babys and Bad English, John Waite. With their heavily orchestrated, sweet ballads, Air Supply scored a string of seven straight Top Five singles. Vocalists Russell Hitchcock and Graham Russell met while performing in a Sydney, Australia production of Jesus Christ Superstar in 1976. The two singers formed a partnership and with the addition of four supporting musicians, Air Supply was born. As a solo artist and a lead singer, English rocker John Waite has a talent for power ballads and driving arena rock, occasionally touching on new wave-styled power pop as well. In 2011, the title track from his tenth solo album “Rough and Tumble” went number one on Classic Rock radio. Air Supply & John Waite – Saturday, February 11 at 8:00 pm – Click here for tickets!